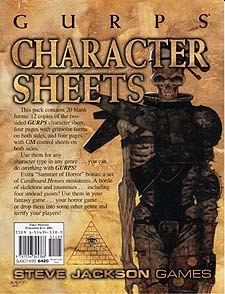 This pack contains 20 blank forms: 12 copies of the two-sided GURPS character sheet, four pages with grimoire forms on both sides, and four pages with GM control sheets on both sides. Use them for any character type in any genre... you can do anything with GURPS! Extra "Summer of Horror" bonus: a set of Cardboard Heroes miniatures. A horde of skeletons and mummies.... including four undead giants! Use them in your fantasy game... your horror game... or drop them into some other genre and terrify your players!